I have long been perplexed by the existence of various Pelikan ballpoints and fountain pens that feature a cap with a nib on a chain rather than a clip. 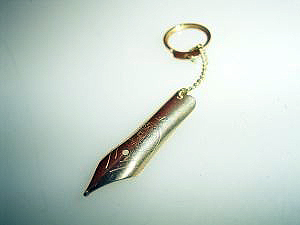 The extra nib hangs off of the cap, almost like a charm would. 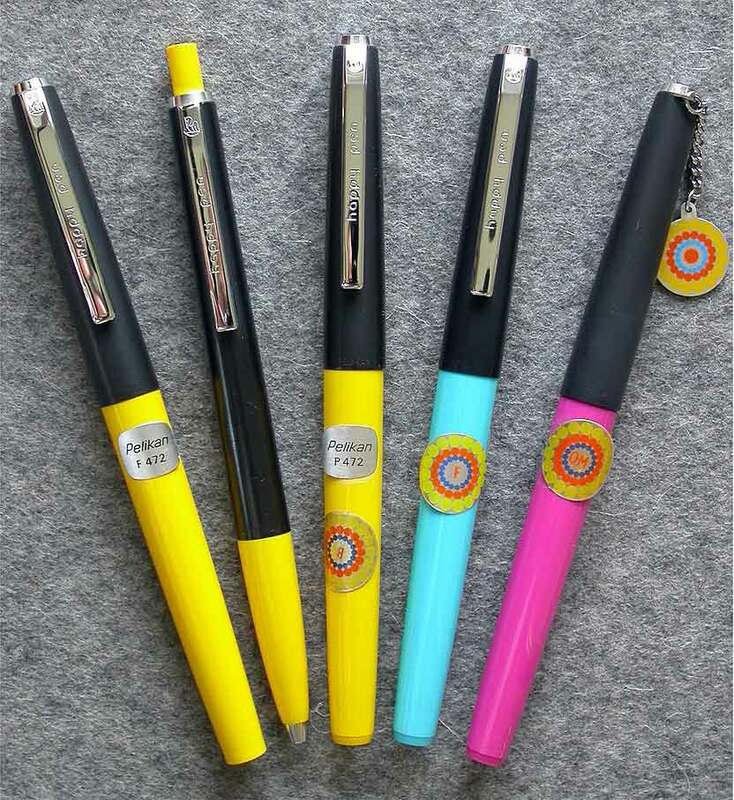 That is not an entirely foreign concept as Pelikan tried something similar with their ‘Happy Pen’ in the 1970’s. This variation of the tradition series is not well documented, however, in any of the materials that I have ever found. No mention of it is made in either edition of Pelikan Schreibgeräte. It certainly seems to be an odd choice of design and not very practical. After much fruitless searching, I inquired from the most knowledgeable source that I know, Jürgen Dittmer of the Pelikan archives. What I learned was also corroborated by information from Regina Martini, a well-known Pelikan retailer. The truth, it turns out, is nothing that exotic. 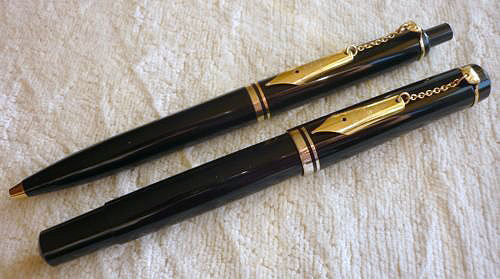 Jürgen tells me that in order to reduce an overstock of nibs, Pelikan produced a limited edition of fountain pens, ballpoints, and pencils with a nib in place of the clip. The limited edition must have occurred sometime before 1997 as I have only seen this variation on the older, pre-’97 trim pens. I have also only seen this on M200 and M250 series fountain pens and their corresponding ballpoints/pencils (K200 & D200). If nothing else, it was an interesting way to reduce stock. 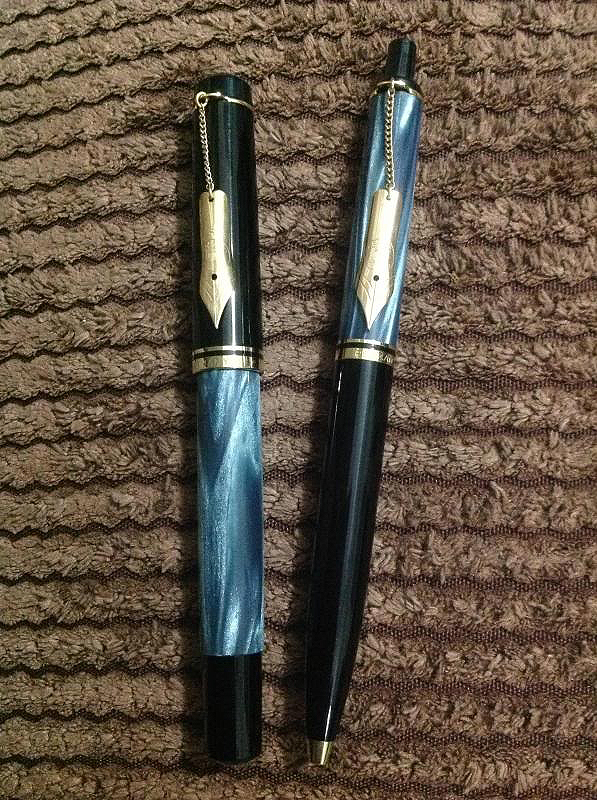 Pelikan M250 & K200 Blue Marbled Nib-on-a-Chain Editions. Picture courtesy of Daenghafez of FPN.